There are some installations in which you can't hide the fan grilles, no matter how hard you try! When vent openings are going to be visible, Cool-vent II or III may be the answer. Shipped in intake mode, each can be reconfigured to quietly move air out of an enclosure, and consists of a fan assembly and a very high quality wood grille. 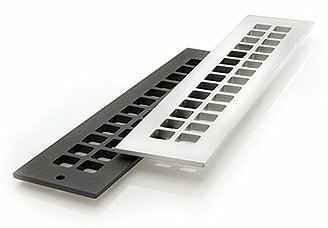 Cast aluminum grilles are also available, made by made by Reggio Register, the leading supplier of HVAC grilles and registers in the U.S.
Cool-vents II and III remove the heat generated by audio-video electronics in home theater or commercial environments when equipment is installed in cabinetry and ventilation systems will be visible. Temperature controlled by a remote thermal probe connected to an all-electronic control module, Cool-vents turn on at 90 degrees and are extremely quiet in operation. Available unfinished in many species of wood (see link to list below) and several designs and finishes in cast aluminum, the wood Cool-vents easily separate into fan and grille sections. After painting or staining the wood to match the client's enclosure, the fan assemblies screw back onto the grilles, facing one way to exhaust hot air, or the other way to bring fresh air in. 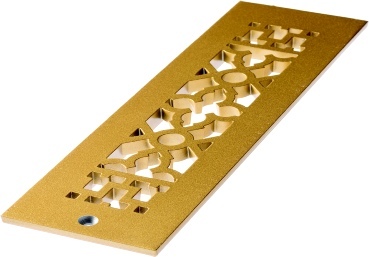 The grilles are also available without fans to use as matching passive inlets or outlets. Click HERE for the list of available woods. Click HERE for aluminum finishes. Click HERE to see aluminum finishes.